The question of how many Jewish Americans there are does not have a simple answer. That’s because the number of Jews in the U.S. depends on how one defines a Jew, as explained in the Pew Research Center’s major new survey of Jewish Americans. There are about 4.2 million American adults who say they are Jewish by religion, representing 1.8% of the U.S. adult population. But there are roughly 5.3 million Jews (2.2% of the adult population) if the total also includes “Jews of no religion,” a group of people who say they are atheist, agnostic or “nothing in particular” when asked about their religion but who were raised Jewish or have a Jewish parent and who still consider themselves Jewish aside from religion. This is the net Jewish population as defined by the Pew Research report. Two other groups were not counted as Jews in the report. 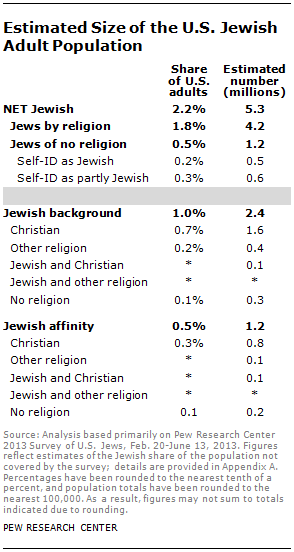 There are an additional 2.4 million adults in the “Jewish background” category – that is, people who were raised Jewish or had at least one Jewish parent, but who now either identify with a religion other than Judaism (most are Christian) or say they do not think of themselves as Jewish or partially Jewish, by religion or otherwise. Also, there are 1.2 million adults in the “Jewish affinity” category – people who were not raised Jewish, do not have a Jewish parent, and are not Jewish by religion but who nevertheless consider themselves Jewish in some sense. Estimating the number of Jewish children presents another challenge. About 1.8 million children live in a household with at least one Jewish adult (not necessarily a parent). Among those, roughly 900,000 are being raised exclusively Jewish by religion; 100,000 are being raised with no religion but as Jewish aside from religion; and another 300,000 are being raised partly Jewish and partly in another religion. About 400,000 children are not being raised Jewish at all despite living in a household with at least one Jewish adult. It is difficult to track how the size of the Jewish population has changed over time, but surveys in the 1950s and 1960s consistently found that between 3% and 4% of American adults said their religion was Jewish. While the share of adults who say their religion is Jewish has declined over the past five decades, the count of adults identifying as Jewish by religion has increased by roughly 15% since the Census Bureau’s 1957 Current Population Survey. This means that in the long term, the total number of American Jews by religion has increased while the share of Jews by religion has declined because growth in the Jewish by religion population hasn’t kept pace with the overall population.